At a time where millions of games are available in your pocket, going back to playing actual board games can be dull. However, there are ways of keeping a board game's charm while adding a little bit of geekery to it, too. RealMaze, created by software technician "PCDev", is a cool and quirky take on the Labyrinth board game (you know, the one where you guide a ball through a tilting maze without falling down the holes) using an Android phone and a DemoKit. The idea is based off Google's own ball maze demo presented at Google I/O 2011--albeit a scaled down version with a few tweaks to the phone's controls. PCDev re-constructed the board by adding servos to the inside of the base, which are attached to two lever arms. The arms will then tilt the board in different directions to move the ball around the maze. 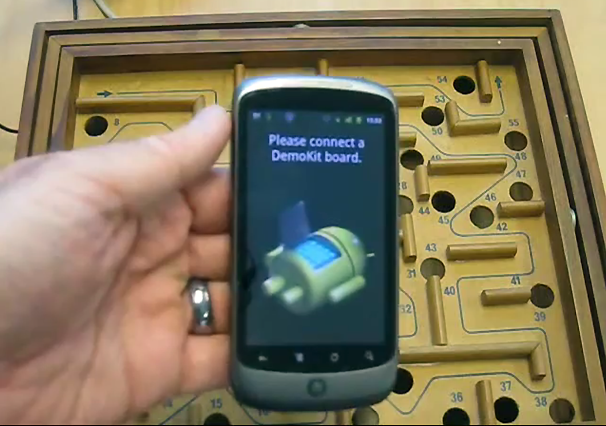 The servos are connected to Google's DemoKit--an Arduino board plus an Android Sheild to go on top--which relays to the phone on the other end. If you don't want to delve too deep into app-tweaking, you could just download the DemoKit app available and use the controls provided. Although the app uses slider controls rather than tilting, so you may want to do a little tinkering, like what PCDev did. He instead modified the app to allow the Labyrinth board to mirror the tilting of the phone, creating slightly smoother and sensitive controls. Not convinced? You could always just download Labyrinth for your phone from the Android Market.